Few anatomic structures have received more attention in the realm of chronic illness than the adrenal glands. Numerous books, articles and research papers have been published over the past few decades resulting in the near universal employment (medical and “alternative") of a plethora of remedies, protocols and therapies to “treat” the various forms of adrenal dysfunction. Many unsuspecting patients, however, are unaware that the very treatments they are prescribed have little to do with the causes of their problems and in many cases further burden the body and deepen chronic illness. The adrenals, also known as the suprarenal glands, are endocrine structures that produce and secrete a variety of regulatory hormones including Adrenalin, Aldosterone and Cortisol. Highly complex feedback mechanisms allow the body to closely monitor and adjust how much hormone is produced in order to maintain a state of balance, or homeostasis, in an ever changing, dynamic environment. In this regard, the Adrenal glands work closely with the Hypothalamus, Pituitary and Thyroid gland as part of a physiological “jazz band” known as the HPTA Axis. All cells of the body and all functions of the body are influenced by this system and the hormones it produces. Cortisol imbalance is often associated with cases of chronic illness, particularly those involving allergy and autoimmunity. Cortisol, often referred to as the “stress hormone” of the body, is involved not only with the stress response but also with the regulation of blood sugar, fat and protein metabolism, energy production and inflammation. Under normal (non-stressful) circumstances, the adrenal glands will produce approximately 25-30 mg of cortisol daily. Adrenal Fatigue: A cause or just another symptom? We commonly hear from patients entering our practice, who have been diagnosed with various chronic illnesses, that their health problems are caused by “adrenal fatigue.” In most cases, they’ve reached this conclusion having read one of the many one can find on “Dr. Google,” having had their frequencies read by a “Rife Machine” or other questionable diagnostic procedure, or having simply been told by their Physician (commonly an Alternative, Functional, Complementary or Integrative or Anti-Aging Doctor) that this is their problem. What they fail to recognize is that “adrenal fatigue,” much like their joint pain, skin rash, allergy etc., is also just a symptom and cannot cause itself. We counter the patient by asking them, “What caused your adrenal fatigue?” It is at that moment that the patient may come to the realization that they have been blaming symptoms for their problems rather than addressing causes. A New patient shows us the various adrenal supplements she's used along with drug hormone therapies prescribed by her "functional" medical Doctor. Many of these same patients, upon arriving at our clinic, reveal to us a variety of “Adrenal supplements" they’ve been taking (see photo to the right) to "treat" adrenal dysfunction and various chronic maladies. Many of these products contain adrenal glandulars (from porcine or bovine sources), various herbs and other materials to supposedly stimulate adrenal function. Despite the extensive use of these products and other treatments, long-term improvement is rarely if ever achieved. Some report feeling temporary “stimulation,” but the change is not the result of a return to good health and normal function, but rather from the stimulating effects of a toxic material. Repeated goading from the extensive use of such products burdens the adrenal system, weakens the glands and leads the patient further into chronic illness. When studying under Dr. Goldberg as a student and a new practitioner, he had cautioned me about this and now in practice I have seen this scenario numerous times. At the Goldberg Clinic, Dr. Goldberg and I work primarily with patients suffering with a wide variety of chronic health issues. Our focus with patients is not to “treat” symptoms or conditions, but rather to identify and address causes and build health. A thorough case history, examination and appropriate laboratory studies are utilized to understand each patient’s unique circumstances and develop a specific individualized program to support health. In many cases, an assessment of adrenal function is part of our patient evaluation. If adrenal dysfunction is identified, further investigation is then warranted. A thorough look into the patient’s history, lifestyle habits, behaviors and stressors often provides the clues as to causation and what steps are needed to support a return to normal function. As no two patients are the same, the factors involved in each case vary significantly. The adrenal glands are resilient and have the ability to recover under the right conditions. At our clinic, this involves the implementation of an individualized program tailored to each patient’s needs. With the proper steps taken and patient compliance, not just adrenal recovery but body wide recovery is possible in many cases within 3-9 months. To learn more about the Goldberg Clinic Approach, click here. Test interpretation: The Adrenal Stress test measures cortisol secretion over the course of one day. Readings are taking in the morning, afternoon, evening and midnight. Cortisol readings should be highest in the morning and then gradually taper off as the day goes on. On the test report, the red and blue lines indicate the upper and lower limit of normal respectively. The black line is the patient result. There are many variations in the results and experienced, professional interpretation is critical along with knowing what to do to address the findings. Show normal. 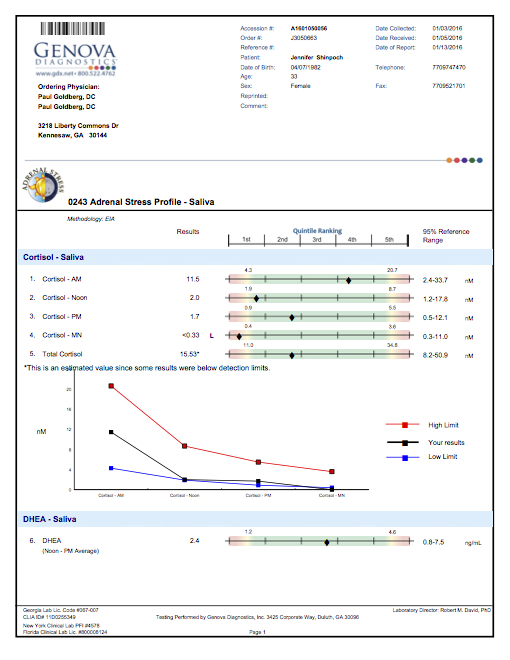 Below are recent before/after Adrenal Stress Test results from patients at our clinic. The improvements seen came by addressing each patient's entire health picture and without the use of drugs, herbs or other treatments/therapies. Many of these patients had mistakenly employed such treatments prior to coming to our clinic. Case #1: Autoimmune Thyroid Disorder, Chronic Fatigue. Click here to view patient video testimonial. Case 2: Severe Allergies, Chronic Fatigue, Digestive Issues. Case 4: Chronic Indigestion, Anxiety. Case 5: Hypothyroidism, Fatigue, Overweight.